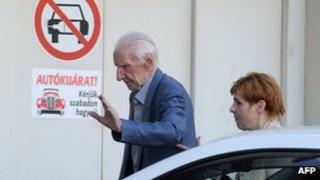 New charges have been filed in Slovakia against a 97-year-old Nazi war crimes suspect, who is under house arrest in neighbouring Hungary. Laszlo Csatary allegedly persecuted opponents of the pro-Nazi Hungarian regime that ran the town of Kosice during World War II. His presence in Budapest made headlines last month, when reporters from the UK's Sun newspaper tracked him down. He is suspected of assisting in the murder of 15,700 Jews during the war. On Wednesday Mr Csatary was questioned by Hungarian prosecutors. He insists that he was merely an intermediary between Hungarian and German officials in Kosice and that he was not involved in war crimes. Kosice - called Kassa at the time - was the site of the first Jewish ghetto established on Hungarian territory, following the German occupation of the country in 1944. The Nazi-hunting Simon Wiesenthal Center accuses Mr Csatary of involvement in the deportation of 15,700 Jews from Kosice to the Auschwitz death camp. A spokesman for the Slovak state prosecutor's office said the latest charges concerned "responsibility for the deportation of Kosice residents to Germany". A man whose father was deported to Germany in January 1945 made the accusation against Mr Csatary. The case against Mr Csatary in Slovakia means that extradition proceedings may be launched. In 1948, a Czechoslovakian court condemned him to death in absentia. On Monday the Slovak Justice Minister, Tomas Borec, said he would like to see Mr Csatary put on trial in Slovakia. That has also been requested by leaders of Slovakia's Jewish community. Slovakia no longer has the death penalty, so a guilty verdict against Mr Csatary would probably mean life imprisonment. After the war, Mr Csatary escaped to Canada where he worked as an art dealer in Montreal and Toronto. He disappeared in 1997 after he was stripped of his Canadian citizenship. Laszlo Csatary: Is Hungary's Nazi suspect worth pursuing?